January 31st marks the closing of the centenary of Thomas Merton’s birth. 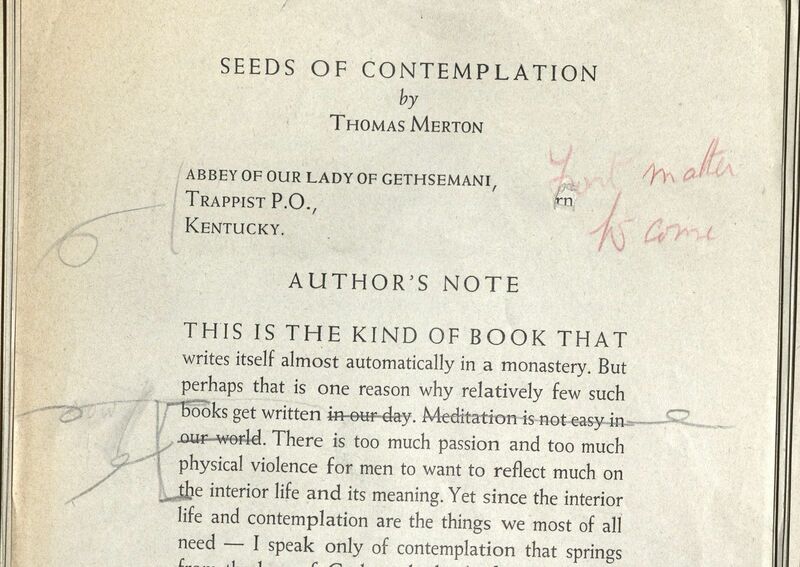 Merton is best known for his 1948 autobiography The Seven Story Mountain, which charted his trajectory from world citizen and aspiring literati to cloistered monk at the Abbey of Our Lady of Gethsemani in Kentucky. In addition to writing prose and poetry related to spirituality and social concerns, Merton was at the forefront of interfaith dialogue with Eastern religious traditions. He was one of four Americans highlighted by Pope Francis in his address to a joint session of the United States Congress in September of 2015. Even when limited to the brief time period when Thomas Merton was active, Houghton Library’s collections cover a vast and diverse assemblage of figures, movements, and institutions within the realms of literature, academia, politics, and the arts. In addition to the Modern Books and Manuscripts Department, Houghton houses subject collections in Printing and Graphic Arts, Theatre, and Poetry. Remarkably, Merton is present in each of these collections, speaking to the extent and breadth of his involvement in the world. The reach of his correspondence alone is an Erasmian patchwork of geography and subject that belies the notion of monastics being separate from or indifferent to humanity outside of their cloisters. The most substantial cache of Merton holdings at Houghton can be found in the records of New Directions Publishing Corp., which published not only his first book but several of his most enduring. As might be expected, the publishing process is well documented through galley and page proofs, promotional material, and business correspondence. Because New Directions also published the work of many of Merton’s friends and mentors, there are traces in its records of his life before Gethsemani. Merton was, to put it politely, something of a libertine. Unable to return to Cambridge University after fathering an illegitimate child, he enrolled at Columbia and promptly joined a raucous fraternity. He also decided to take a class in English literature taught by Mark Van Doren, which proved to be of more lasting importance to his future. In addition to being a Pulitzer Prize winning poet, Van Doren taught a host of literary luminaries over his distinguished career, including John Berryman, Allen Ginsberg, and Jack Kerouac. Van Doren was a remarkable advocate for his students, and sent a short note in May of 1940 to New Directions founder James Laughlin recommending the future scholar Andrew Chiappe and Merton for publication. Appropriately, given Merton’s enigmatic and restless nature, Van Doren had no idea where he was at the moment. As it happens, he was in Cuba on a pilgrimage. He had converted to Catholicism two years prior, and on his return to New York would give up his Greenwich Village apartment to teach at a Franciscan college upstate. A year and a half after that he would burn a number of his manuscripts, send a few choice works to Van Doren and other close friends, then board a train for rural Kentucky to enter a monastery he would only occasionally leave for the remainder of his life. 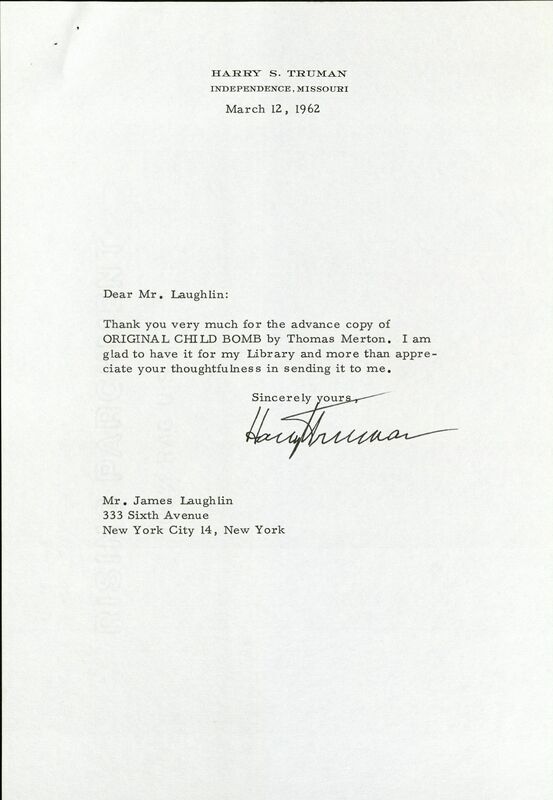 Laughlin would become more to Merton than a business associate. Over time he became one of Merton’s most trusted and valued friends, and as a result their correspondence (published in part as Thomas Merton and James Laughlin: Selected Letters) reveals much about each, including evolution in Merton’s thought. In 1951, for example, an overly-pious Merton voiced concerns to his agent about being published by a house putting out “morally undesirable” material. To name just one example, Henry Miller was on the New Directions roster. It’s not unusual that a relatively recent convert choosing to live a strict monastic rule might feel this way, even if this particular convert’s literary heroes weren’t bourgeois “spiritual” writers, but modernists like Joyce. Eventually his love of good literature beat out his concerns of propriety. By the 1960s Merton was corresponding with Miller and asking Laughlin to arrange a visit to the monastery with Ferlinghetti and Kerouac (bMS Am 2077 (1136), letter dated April 20, 1960). As an extension of his publishing duties, Laughlin arranged a recording of Merton’s poetry through the celebrated Harvard Vocarium program. The Harvard Poetry Room had been recording readings since the 1930s, inaugurated by Harvard’s most august 20th century poet, T.S. Eliot. The hitch, of course, was that Merton was unable to leave the monastery. In his place the British actor Robert Spaeight read three of his poems, to very modest success. Although Merton had once been concerned about the propriety of publishing at New Directions, in part due to what Church censors might think of its other writers, when the Cold War and its tactics coalesced he found his beliefs in deep conflict with censors on subjects he considered to be of extraordinary moral importance. By the early 1960s Merton had become an outspoken critic of nuclear proliferation and the budding conflict in Vietnam. His found poem “Original Child Bomb,” a meditation on the atomic bomb dropped at Hiroshima, garnered attention in religious, beat, and activist communities. Laughlin sent a copy of the poem to a number of politicians, including both John and Robert Kennedy. Their stock responses thanking him for its receipt would seem to indicate neither actually read the scathing indictment. The thank you note from Harry S. Truman is so unaware it borders on dark humor. This movement in Merton’s poetry from respectable religious imagery to biting sarcasm and outrage didn’t sit well with a Church hierarchy enjoying newfound acceptance in the wake of the election of the first Roman Catholic president. Questioning the West at the height of the Cold War wouldn’t be tolerated by the Church. Merton was told not to publish anything more on political or secular matters. In response, he decided to distribute such pieces to a few hundred readers through private channels, ostensibly sending a letter to one recipient, which could then be mimeographed and sent to other interested parties. Occasionally these recipients would take the initiative to publish the letters (without the author’s name attached) in various liberal Catholic publications. Laughlin, while never fully understanding Merton’s vow of obedience, was concerned that his friend should be breaking it. “I have apparently shocked…you,” Merton wrote in 1961, “and given you the idea that I am indulging in some kind of monkey business,” before going on to explain how his plan was technically licit. While the censors would eventually lift their restrictions, he continued to find the circulars a useful way to correspond with a large number of people at one time. Circulars can be found in a number of collections at Houghton, both in correspondence with figures whose papers are now housed here, and in a 2004 acquisition of ca. 170 printed items written or owned by Merton. This latter acquisition also includes fine early editions of his published works and numerous periodicals containing his articles. The tension between speaking out and silence was persistent in Merton’s life. Silence was, after all, the cornerstone of his spiritual writings. His thoughts on contemplation, a category of Christian prayer similar to Eastern meditation, naturally found expression in not just literary but pastoral activity. A striking example in Houghton’s collections can be found in a typescript letter to Samuel Reese, a prisoner on death row who had converted to Christianity, took to making art, then teaching art to other inmates. He had written to Merton for advice related to his interior life. Merton’s reply covers themes common in much of his published work (“Your meditation does not need to be too abstract…think of the way you are when you ‘sense’ the reality of some good thing — light, silence, the sky.”) contextualized for the life of a man imprisoned for murder. Letter from Merton to Samuel Dismas Reese with prison inspection stamp. Autograph file, M.
While he certainly saw his duties at the monastery and his published work as his vocation, his correspondence came to occupy a central part of his calling as well. He described this work in a letter to Pope John XXIII as an apostolate of friendship, a way to offer support to a circle of friends consisting of “artists, writers, publishers, poets, etc.” from his unique, grounded position within the monastery. This circle proved wide. At Houghton alone his letters can be found in the papers of Ocampo, the French novelist Marguerite Yourcenar, and the dancer, actress, choreographer, and opera director Vera Zorina. At times the letters are deeply personal, as when he comforts Ocampo on the death of her sister. Other times they focus on artistic concerns. A recurring theme in the letters with Zorina is the possibility of his translating Hoenegger’s Jeanne D’Arc Au Bucher for a performance she planned to give in London. Unfortunately, while he had long been both a fan of the Hoenegger opera and a friend to Zorina, he couldn’t fit the project into his schedule. Although he was primarily a writer, Merton maintained a strong interest in the visual arts. While in Kentucky, he struck up a friendship with the Viennese printer Victor Hammer, who ran a small press in Lexington and would print fine press editions of several of Merton’s texts. He also gave the author the benefit of changing his texts at his leisure without deadline, something large publishing firms like New Directions couldn’t afford to do. Copies of The Solitary Life and Merton’s introduction to Mencius’s Ox Mountain Parable can be found in the Printing and Graphic Arts Collection at Houghton. “For J.” bMS Am 2077 (3929a) Copyright the Merton Legacy Trust. Used with permission. 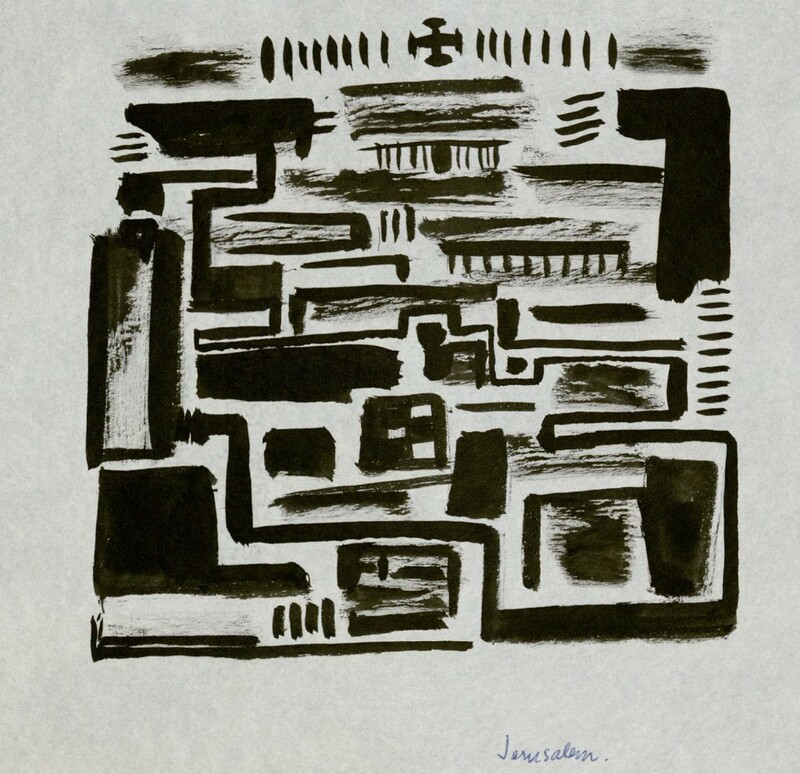 Merton was not just an art connoisseur, but an accomplished artist in his own right. 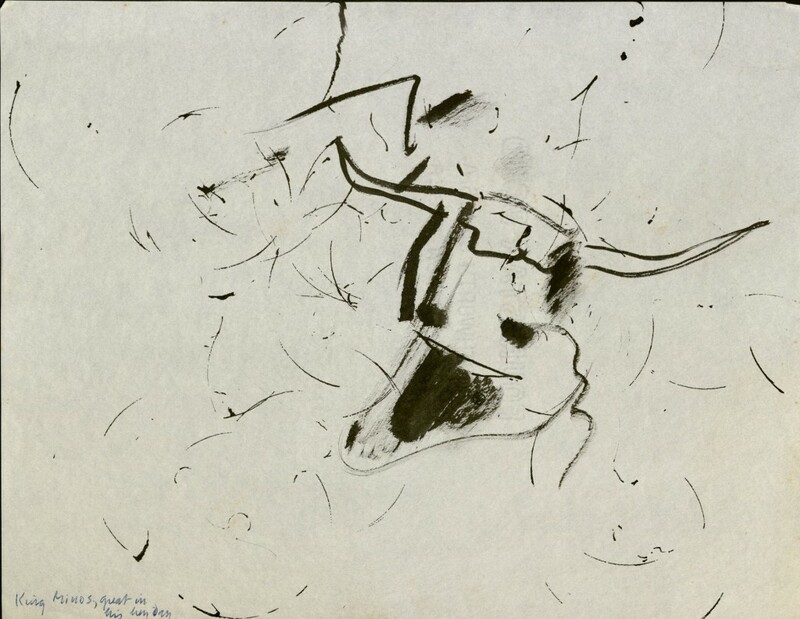 He took on many mediums, but is perhaps best known for the photography and abstract brush drawings he took up late in life. 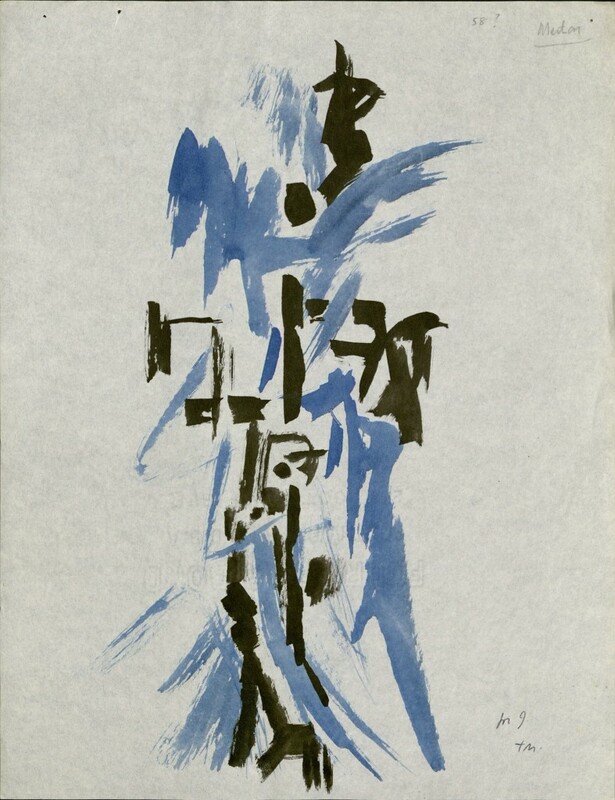 The brush drawings were calligraphic, in the style of Zen artists. He shared several of these with Laughlin over the years. He would also send Laughlin depictions of Greek mythology, for which the two men shared a love. “King Minos, great in his heyday.” bMS Am 2077 (3929a) Copyright the Merton Legacy Trust. Used with permission. His apostolate of friendship had already encompassed D.T. Suzuki and Thich Nhat Hanh, but in the last few years of his life Merton began to focus more earnestly on dialogue with Eastern religious traditions. He was granted permission in 1964 to briefly visit the aging Suzuki in New York. But because of his vow of stability, most East/West dialogue happened by mail. In 1968 a new abbot at the monastery granted Merton permission to attend an interfaith conference on monasticism in Thailand, which seemed to open up a third chapter in his life. The trip would afford him the ability to make stops throughout Asia, visiting religious leaders and practitioners he would otherwise not have had access to. Merton had once been an expert traveler, but he was decades out of practice and required help from Laughlin to negotiate logistics. His publisher secured Merton’s credit card (so long as he promised not to lose it in an opium den) and advised him on inoculations. The trip was an immediate success. After stops in California and Alaska, he went on to Asia, all the while filling two notebooks with thoughts, poems, and impressions. In India he met with a number of people, most notably the Dalai Lama, who at the time rarely met with Western visitors. The Dalai Lama has cited Merton as an influence on his own interfaith work, and praised Merton’s internalized knowledge of the essence of Buddhist practice. Several stops later he arrived at Bangkok for the conference. His trip had been fruitful enough so far that he already planned to extend his itinerary to additional stops in Asia and Europe. On December 10, 1968, the 27th anniversary of his entrance to the monastery, he delivered the paper that had occasioned his trip. The reception was enthusiastic. He retired to his room for a nap. His body was found that evening, all evidence pointed to a freak electrical accident. Thomas Merton was dead at the age of 53. The news blindsided both the world at large and his friends in particular. One of those friends, James Laughlin, had been entrusted as a literary executor of his estate and found himself hard at work soon after. Merton had mailed him the mostly finished manuscript to Geography of Lograire, a challenging and expansive poetic work, before he left America. Laughlin spent months painstakingly editing the manuscript himself, which involved clarifying numerous anthropological and religious references, writing footnotes, and clearing permissions. Evidence of that trust is in the legal documents naming him as one of the directors of his trust. 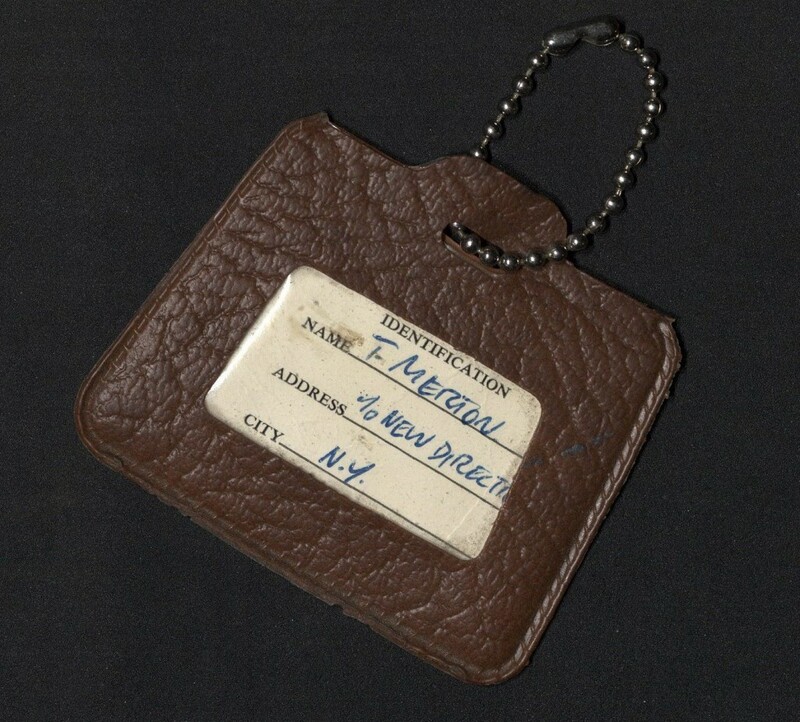 But a more personal and tangible sign of that trust is the tag from his manuscript valise for that final trip. The return address was not the Abbey of Gethsemani, but New Directions, and it is now filed at the end of Merton’s correspondence in the New Directions records at Houghton. wonderful commentary and photos. thank you.